Last week, local MP Rory Stewart joined volunteer organisation Fix The Fells to hear about their work across Lake District, before joining the group to clear drains on Gowbarrow Fell. Whilst out on the fell Rory learnt about Fix The Fells’ sustainable prevention and restoration techniques on Lakeland footpaths. Repairing and maintaining the ancient network of mountain paths is an all-weather task and Rory and the volunteer group braved the Cumbrian elements to maintain the recently opened ‘Ullswater Way’. A continuous series of footpaths that allow walkers to walk the whole way around Ullswater. Fix The Fells work throughout the year to repair and maintain these paths using traditional Roman techniques such as sheep fleeces and stone-pitching, combining these with modern techniques that include using helicopters to transport stone. All their repairs are in keeping with local building techniques, and the group have repaired over 200 sections of paths in the last ten years. The combination of millions of feet and the Lake District’s weather means that erosion is a constant problem for the group. However, in 2016 volunteers broke all records and gifted 1,936 days on the mountain paths. And 2017 looks set to be another record-breaking year. The volunteers are known as lengthsmen – which is a term for anybody involved in maintaining paths, whatever their gender. Around 100 lengthsmen volunteer for Fix the Fells and they support the National Trust’s upland ranger teams who work across the Lake District, clearing drains all year round and rebuilding remote fell paths during the warmer months. In 2016 the lengthsmen went out almost 500 times and cleared thousands of drains. 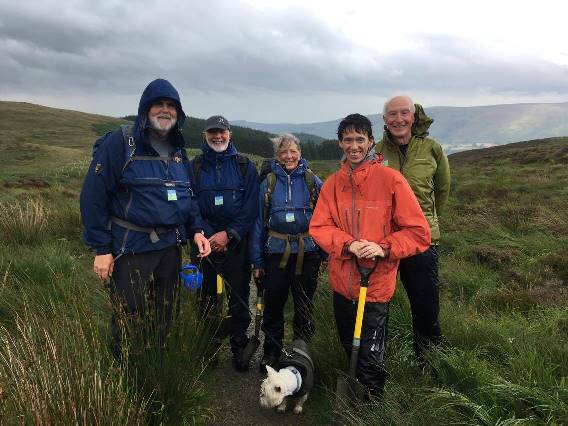 “We were delighted to explain and show Rory some of the work carried out by the Fix the Fells Volunteers on Gowbarrow in the Ullswater valley. The volunteers help repair and maintain eroding footpaths in the whole of the National Park all the year round and in all weathers. Rory was interested in understanding what were the key factors driving the overall success of the Fix the Fells “volunteering model” and whether these could be applied in other volunteering situations such as local village communities or for flood resilience maintenance. With Rory living in this most beautiful area his support for the scheme is most important to us. As some 18 million visitors come to “The Lakes” each year, the effect on the Fells is clearly visible and remedies need to be addressed to protect this magnificent landscape for future generations.